The great thing about MillionMileGuy is that the site shows you flights from all of those places in a single place. Some of those websites (Thrifty Traveler and Scotts Cheap Flights) offer premium subscriptions that send users additional flights that I won’t have on the website, but in general, this is the best single source of (freely listed) cheap flights in the world. I have feeds set up to pull flights from the best cheap airfare websites in the world. When a reader sees a flight that interests him, he clicks on the flight which then opens a new window and redirects that person to the site where the flight deal originates. For example, if you’re searching for a flight from Chicago, click on it, a new window will open with the specific flight deal from the original website that it came from. You should also be able to tell where that deal comes from before clicking on it by hovering the mouse over the flight deal, and the web address should display in the lower left hand corner of your screen. 1) The discount flight websites are great resources, and I’ve used them for years. If I can help them earn some extra business, and help others find good deals, then all the better. 2) I’m trying to give my readers the travel resources. In this case, the best (free) options for cheap airfare. There are a couple ways you can find cheap flights on my website. The first, and probably easiest, is to click on the Flights tab on the upper part of the website homepage. Once you’re on the Flight Page, you can enter in the specific city that you’re interested in. You can type in the city name or airport code and results should appear. For an example I typed in MSP (airport code for Minneapolis) and only MSP related deals appear. Only one city at a time can be typed in, so separating cities with or without commas won’t work. Use the Search area to your advantage. In this case, I searched for Minneapolis flights (MSP). Flight deals by city then follow (results below). 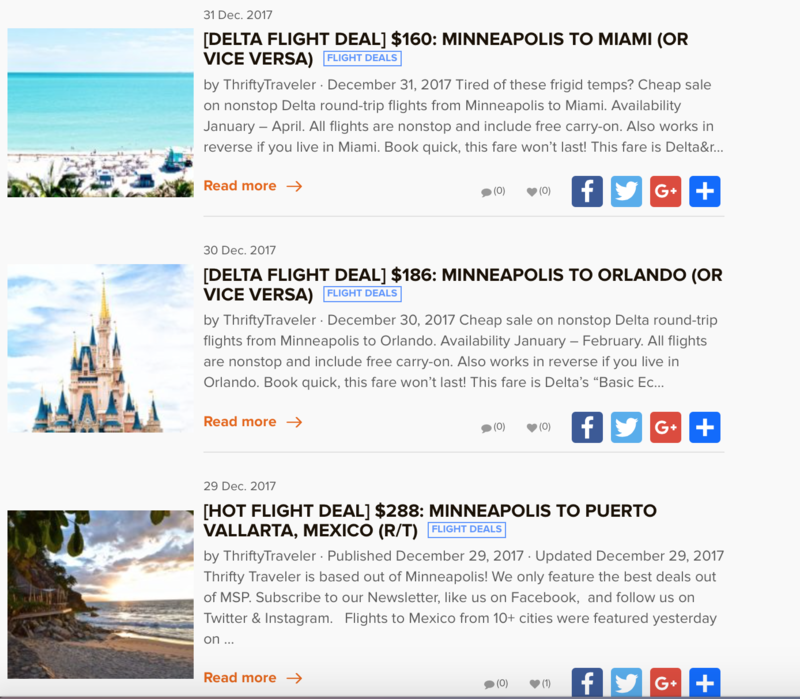 On the websites’s main page just below the Blogs area, there is a scrolling list of flights (called “Fight Deals”) that has an assortment of deals listed. You can view the flights as they appear, use the back and forward arrows to find possible deals, or click on “View All” which will then bring you to the Flights Page. From there you can view flights vertically or do a simple search by airport or city. The process and website are pretty simple but powerful. On Friday I found a flight for $374 from Minneapolis to Hawaii on my website (from Fly4Free) that I capitalized on. Looking forward to some sun and warmth in a few weeks!